But FOX News! Rightwing conspiracy! It's just people who don't like Obama! Meh. I have no idea if any of that is true, but they seem to be the most common "counterpoints". Who cares that only FOX News reports it (if true)? Is that a statement about FOX News or a statement about other networks? What is this, actually? The X axis is probably the year, but what is displayed on the Y axis? And what's the background story? Can you please revive your excellent old habit of actually explaining the graphs you post in your blog? Because most commentators fancy themselves as smarter than the average Joe too. Morally superior to the college graduate who is a capitalist (who btw, contributes a great deal to finance their education). Thus, they believe they have a duty to spend OPM, for everyone's benefit. It is a plot of the federal deficit by year. Up to '08 is historical data, the remaining years are projected numbers, both the CBO estimate and the (less conservative) White House estimate. Shenpen, is this actually the first time you've seen this graph? Regardless, the Y-axis is labelled in the top left corner. It's the Federal deficit (or surplus), expressed in billions of dollars. Frankly, I think the black background is an improvement on the original white one, as it (to me) increases the contrast graphically, which shows more clearly the difference between the President's projections and the CBO's projections. What's to understand? Ms. Garofalo expressed it well: if you're against government spending you're racist. It's so simple! But I'll tell you what: like everything that is simple, this here redneck didn't understand it until it was explained to me by my Betters from El Lay. You can see Obama's First Five Year Plan and Second Five Year Plan in this graph. He wants a bad 2009 to rebound in 2010 in time for the Dems to continue control of Congress. 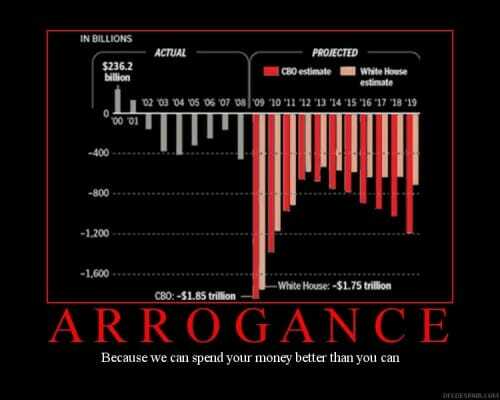 We'll se continued improvement until he gets re-elected in 2012 ... this will be bought with trillions in post-datd checks. Obmama wants it to blow up after he's re-elected in 2012. We can't run continued deficits like the one s you're seeing above. The taxes needed to cover these deficits will gut the middle class. Definitely no Obama apologist, but do the Bush years include all the spending in Iraq and Afghanistan - they had a clever trick they used to play down their deficits by shifting them "off the balance sheet," so to speak. At least Obama is including those in the budget, which makes it look worse now. And do you really think Bush wouldn't be handing out money like candy right now? Tax breaks wherever possible in the name of economic stimulus?! It's all nasty for the debt (which is, compared to most OECD economies, pretty reasonable in terms of percentage of GDP); it's just a matter of where it's spent - Repubs would spend it on tax cuts and defence, Dems on equalization payments and other liberal issues... lose-lose really. Not sure I understand your last paragraph re: "Repubs". How can debts be spent on "tax cuts"? Also, defense is one of the few legit purposes of the Federal Gov., while "equalization payments" are certainly not. Not to defend the GOP, as it has essentially become the right(ish) wing of the Democrat party. Wow, a DKN? Hehe. I will second his points regarding tax cuts and defense. I don't in particular mind a debate regarding the correct level of defense spending, and I don't know where I'd come out. But I can say that the armed forces are a legitimate use of government funds, while corporate welfare is not. That said, the opportunity cost of electing Obama was McCain, not Bush. And while McCain has a tendency to get cozy with liberal stances, on spending, he consistently supported less of it (along with other Arizona politicians, to their credit). So I'd say the probability of the current situation is much smaller under McCain than Obama. On the other hand, he is a politician and is subject to those incentives that Coyote points out fairly often. I caught PBS' evening news the day of the Tea Parties. IIRC they were the only source that seemed to simply treat them as protests by people against spending and taxes. I don't think they mentioned right wing or republican let alone "astroturf" or any of that other crap conjured up to avoid debating the issue itself. Remember these government numbers are not in accordance with GAAP. The government does not take into account accruing liabilities under Medicare, Social Security etc.... If they did the graph would show multi trillion dollar deficits from '00 on. I like how Obama always says he is going to cut the deficit in half. What he doesn't say is it will still be larger than Bushs largest deficit. Be honest with yourself, David. If these numbers reflected the unfunded liabilities of Medicaid, Social Security, etc., they would show multi-trillion dollar deficits beginning decades ago. Those ginormous deficits have been hidden for many years and are a feature, not a bug, of the system. It's difficult to get voters to re-elect you if you are honest about the true costs of the Great Society, the Prescription Drug Swindle, etc.